BOTOX® Cosmetic is one of the most popular aesthetic enhancement treatments available. This innovative procedure is designed to diminish facial creases, frown lines, crow’s feet, and other signs of age. BOTOX® Cosmetic is derived from a purified form of botulinum toxin type A. The solution works to prevent muscles from contracting in the areas targeted for treatment. This muscle contraction is what often causes wrinkles to appear. Injections are made with a very fine needle in the target areas, and a numbing agent can be applied to minimize discomfort during the procedure. Patients should be able to resume normal daily activities immediately. While there may be some redness and swelling around the injection sites after treatment, this should dissipate within a few hours. 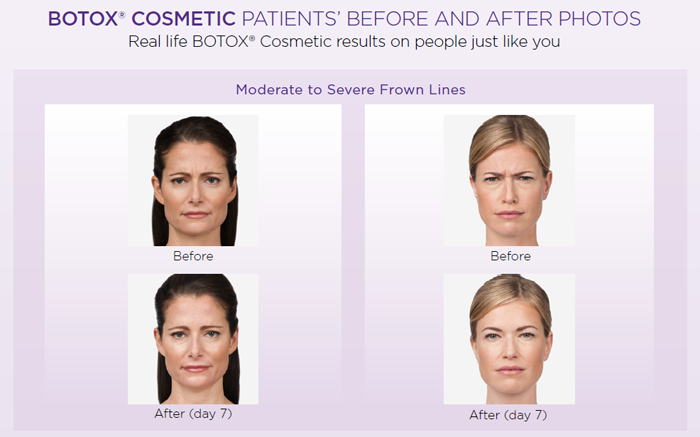 Results from BOTOX® Cosmetic often last for four months, and can be maintained with follow-up treatments. BOTOX® can also be used to reduce excessive sweating (hyperhidrosis) in targeted body areas. The effect of BOTOX® used for excess sweating typically lasts 6 months. With more people seeking a refreshed, youthful look, Botox® has become a hot commodity. What people may not realize is the importance of finding a qualified person with experience and training. An interesting, but not well known fact is that Ophthalmologists are the most experienced administrators of Botox®. For over 20 years, Ophthalmologists have been using Botox® to treat a variety of eye conditions, including eyelid spasms and eye muscle disorders. When Botox® is injected into the eye muscles, it reduces their movement and can be very effective in aligning the eyes. When injected for eyelid spasms, it can help limit the overactive blinking. Patients who were treated for spasms noticed that it also helped soften their wrinkles. This realization led to the use of cosmetic Botox®. So, how does this experience relate to Botox® treatments for cosmetic purposes? Botox®, a non-surgical cosmetic product, is used to relax the muscles of the face that cause “dynamic wrinkles” which are the result of repetitive muscle movements. 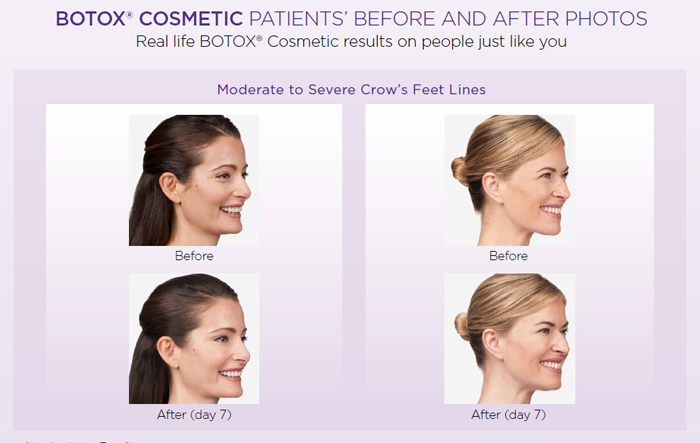 Botox® works great for treating the “l l” lines between the eyebrows, “crows feet” or “smile lines” and deep forehead lines caused by raising our eyebrows. After numbing the area, Botox® is injected into specific target muscles to limit their movement and thereby soften the lines. It is the experience that Ophthalmologists, and particularly Oculoplastic Surgeons, have with these complex muscles that sets them apart from other Botox® administrators. What is an Oculoplasic Surgeon? An Oculoplastic Surgeon specializes in cosmetic, corrective, and reconstructive surgery of the structures surrounding the eye. These structures include the eyelids, tear ducts and orbit (bony socket surrounding the eye). Oculoplastic surgeons are board-certified ophthalmologists who have completed several years of additional, highly specialized training in plastic surgery. Because of this advanced training, they are especially qualified to assess the impact of the eyelids on the health of the eye. When it comes to cosmetic treatments, such as Botox®, having a doctor with this level of expertise and knowledge, is reassuring to people. If you are considering Botox® treatments, make sure your doctor has the experience and qualifications to give you the results you want. Learn how the medication known as Botox may reduce eyelid spasms, help crossed eyes, and treat other eye problems such as blurred vision (diplopia). Helpful medical treatments can come from the strangest places. For a good example, you don't have to look further than a toxin involved in a scary kind of food poisoning that's now being used to treat some eye problems. The drug form of botulinum toxin — called Botox — is probably best known as a treatment for facial wrinkles. However, the Food and Drug Administration has now approved it for strabismus (crossed eyes) and a side effect known as diplopia (blurred vision). It may also help with another eye problem called blepharospasm (eyelid spasms). Botox is found in a rare but serious form of food poisoning called botulism. It occurs when food contaminated with a kind of bacteria known as Clostridium botulinum is eaten (it also sometimes occurs when a wound is contaminated with these same bacteria). Clostridium botulinum produce botulinum toxin — and eating food contaminated with this toxin can cause your muscles to become paralyzed. People with botulism may be unable to move their arms or legs or breathe on their own. The toxins do this by preventing nerves from sending signals to muscles to make them move. The muscles then become paralyzed. Eventually the nerves regain their ability, but it takes a few months for them to make new connections to the muscles. Scientific research led doctors to the discovery that botulinum toxin could be medically useful because of its effects on paralyzing — or relaxing — abnormally tight muscles. In the early 1980s, an eye doctor promoted botulinum toxin as a way to treat an eye problem called strabimus that can affect children and adults. Strabismus causes the eyes to look in different directions; one eye may look inward, creating a cross-eyed appearance, or one eye may look outward. Strabismus can cause vision loss, trouble with depth perception, or double vision (which doctors call diplopia). Each of your eyes has six muscles, and two of the muscles move the eye from side to side, explains Daniel Neely, MD, an associate professor of ophthalmology at Indiana University-Purdue University in Indianapolis whose interests include the use of Botox for eye problems. These muscles keep the gaze straight by working against each other, with equal strength, each pulling the eye in opposite directions. If one of those muscles grows weak, the stronger muscle will pull the eye the opposite way. As a result, your eyes can end up looking in different directions. Strokes and nerve damage can also cause this problem, Neely says. Because the stronger muscle in the eye is always contracting, it can become permanently tight, he says. So when eye doctors treat strabismus with Botox, they inject the drug into the stronger muscle to relax it. This gives the weaker one a chance to recover. In some people who have eye problems such as eyelid spasms (blepharospasms), the issue can be so severe that they can't open their eye and, as a result, can't perform common daily activities such as driving. "For people with this problem, it's life-altering to have access to this treatment," Dr. Neely says. Though Botox can be helpful, it's important to know that it will not cure these conditions, nor does it serves as a permanent treatment. The effects will last a few months, and then you'll need another shot. Before using Botox, your doctor should check for underlying eye problems that could be causing your symptoms. Dry eyes, for instance, can sometimes cause eyelid spasms. Before receiving any Botox injections, also be sure to tell your doctor if you've ever had eye or facial surgery that could put you at risk for side effects. Tell your doctor about any medications you are taking, because the dose may need to be adjusted when you are given Botox. Health experts also urge you to call your doctor if you have any of the following symptoms during the first few weeks after an injection: shortness of breath or trouble swallowing; vision problems; trouble holding up your head or moving your face; fainting; seizures; rash or hives; or chest pain or an irregular heartbeat. The good news is that, when used safely, Botox can improve common vision disorders and provide relief for many people with these eye problems. BOTOX® Cosmetic may be the one for you. You may feel that the moderate to severe glabellar lines between your brows make you look tired or unapproachable, or have other reasons for being curious about BOTOX® Cosmetic. Call Williamson Allemond Regional Eye today to schedule an appointment about BOTOX® Cosmetic and find out if it is right for you. What is BOTOX® Cosmetic? BOTOX® Cosmetic is a prescription medicine that is injected into muscles and used to improve the look of moderate to severe frown lines between the eyebrows (glabellar lines) in people 18 to 65 years of age for a short period of time (temporary). are allergic to any of the ingredients in BOTOX® or BOTOX® Cosmetic.See the Medication Guide for a list of ingredients in BOTOX® and BOTOX® Cosmetic. What are the possible side effects of BOTOX® Cosmetic? BOTOX® and BOTOX® Cosmetic can cause serious side effects. Is BOTOX® Cosmetic expensive? According to the American Society of Plastic Surgeons, the average cost of BOTOX® Cosmetic is approximately $400. Please ask your physician or health care provider for more information as pricing may vary.